A remembrance of Shakyamuni Buddha’s Enlightenment. He realized his true nature sitting in zazen under the Bodhi tree. This attainment was already present in his determination to sit and give up everything; we ourselves bring this to date from the very moment we decide to go to a sesshin in order to practice and experience the same. A sesshin basically consist of practicing Zazen deeply as it was transmitted by Shakyamuni, all Patriarchs from India and China and all Zen Masters heirs to the lineage who have preserved Zazen and Kesa. Master Barbara Kosen continues the teachings following the Dharma principles received from his Master Taizen Deshimaru and by herself realized. On this occasion, Bárbara Kosen has invited Master Ionut Koshin to guide this sesshin because she will be in México and Cuba shesshins. Ionut Koshin through many years was shissui of the House Mokusho Zen, participating in the construction and expansion of several temples in Europe and South America. In June 2016 he received the Shiho, the official Dharma´s transmition, from Master Myoken. 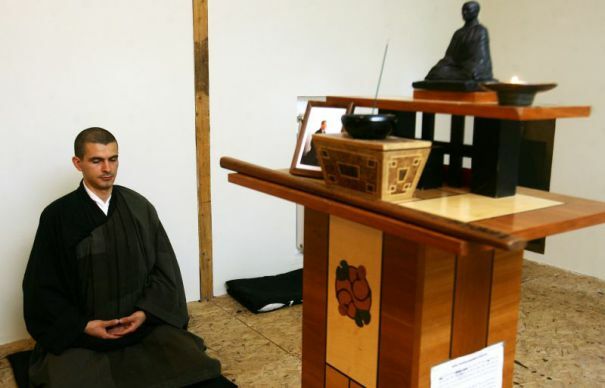 Currently he has the Seido responsibility – resident teacher – in Mokushozen-ji temple of Bucarest and travels frequently to run the practice in other centers in Rumania and Bulgaria. He is university professor and has a PhD in architecture. The sesshin will take place at Shorin-Ji, the Temple at the Forest of Awakening, from December Wednesday 6 to Sunday 10, arriving Tuesday 5 in the evening on time to attend the welcome dinner. Attendance prize is €110. Those who are not members of Asociación Zen Taizen Deshimaru, must register and pay a membership fee of 20 Euros, which covers one year.